Thank you for the kind donation without which I would of not bean able to do so much with Wish. At the Center for America’s First Horse there is so much to do with Wish like riding, liberty, ground work and trail rides. Thank you so much for the scholarship! I have also made a lot of new friends to spend time with. When we are there all together we like to play horses too, not just work and ride them. I have learned so much, and the instructor Mrs. Lockhart is also very nice. And, doing chores at the Center is not hard, sometimes it is FUN! 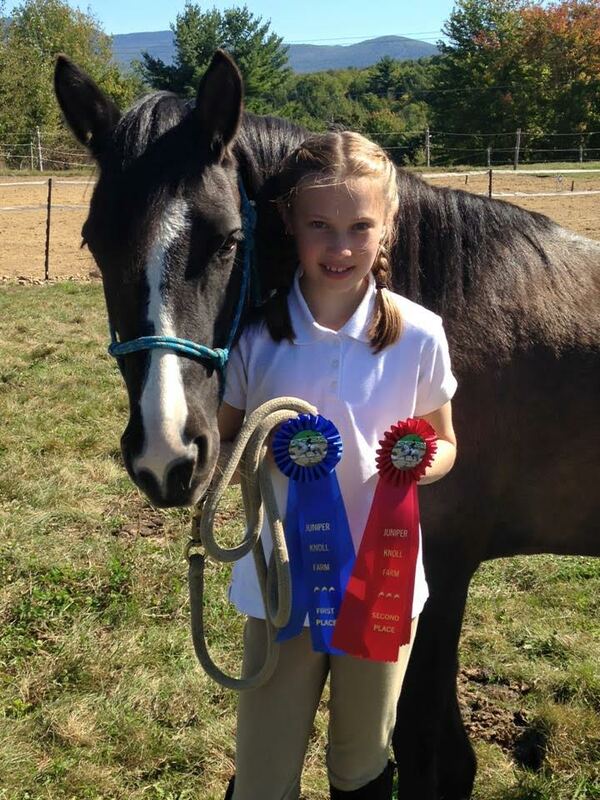 I have included a story I wrote about Wish’s first horse competition and our dressage tests. “Nea, nea” as we are pulling in the long narrow driveway. “We’re here, we’re here” I said VERY happy as we came to a stop. “Are you ready for a long exciting day?” Mom asked. “Yes!” as I am going out of the car. “Here’s WIsh” said Stephanie my instructor. “Let’s get her ready!” she said. “Okay. Mom, can you get my jacket.” “Okay.” “Let’s go to your first test.” In the inside I was nervous and excited at the same time because it was Wish’s and my first show together. I went in the BRIGHT WHITE ring and did my test and came out. “One more to go” I thought. I got off to let her graze. Then Stephanie went to go do something and came back with a ribbon. I could not tell what color it was at first, but then I got a blue ribbon! That is first place, I was so excited. I got back on Wish and went in the ring again and did my next test. When I came out I was excited, I thought me and Wish did an awesome job! I got off and untacked her, put her in the trailer, and Stephanie came back with a ribbon. It was a first place again! I was really happy! We went back to the barn then. I put Wish away in her pasture and said to her “let’s do it some more” and we did!